For the Hall of Fame polo player, see Michael Grace Phipps. Phipps attended Purdue University, where he played for the Purdue Boilermakers football team. He began his college career replacing All-American Boilermakers quarterback Bob Griese. His first major victory was a 28-21 upset of defending national champion Notre Dame Fighting Irish on September 30, 1967. Combining strong passing skills with excellent mobility helped Phipps establish a new school single-season record for total offense and earn the Boilermakers a share of the Big Ten Conference title. 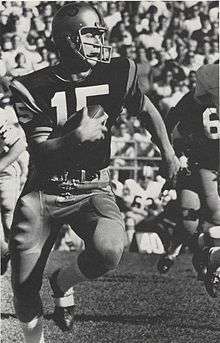 In 1969, Phipps became the focal point of Purdue's offense, throwing for five touchdowns in a 36-35 thriller over Stanford University on October 4, including throwing for a two-point conversion with three minutes left. He finished second in the voting for the Heisman Trophy to Oklahoma Sooners running back Steve Owens. He was awarded the 1969 Sammy Baugh Trophy, he declined the a Rhodes Scholarship to concentrate on a professional football career. Phipps was picked third in the 1970 draft by the Miami Dolphins, who traded him to the Cleveland Browns for All Pro wide receiver Paul Warfield on January 27, 1970. Phipps saw limited action during his first two seasons. In the team's third game of the 1970 NFL season, Phipps came off the bench to lead a 15-7 comeback victory over the Pittsburgh Steelers. However, his lone start of the year would be a 14-10 loss to the Cincinnati Bengals on November 15, 1970, as the rookie finished with 529 passing yards on the season. The following year, Phipps threw for only 179 yards and started just one contest: a 13-7 defeat to the Kansas City Chiefs on November 14. The 1975 season was even more disastrous as the Browns dropped their first nine games and Phipps working under the tutelage of quarterback coach Blanton Collier. The team's first victory came in a 35-23 of the Cincinnati Bengals on November 23 as Phipps threw for a personal high of 298 yards. Two other victories helped give hope for a turnaround the following season. ↑ Johnson, Bryan. "Mike Phipps: Boilermaker Quarterback from Shelbyville". Shelbyville, Indiana. Retrieved 23 July 2012. 1 2 "Hall Call". CBS Interactive. 16 May 2006. ↑ "1970 NFL Draft Pick Transactions". CTS Co. Retrieved 23 July 2012.